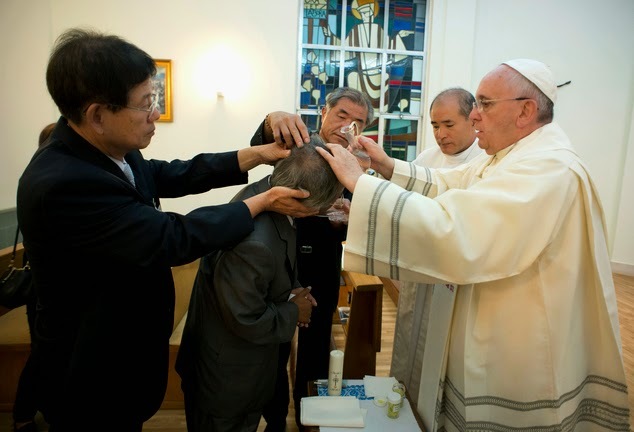 Whispers in the Loggia: In Korea, Francis Is Spreading. Literally. 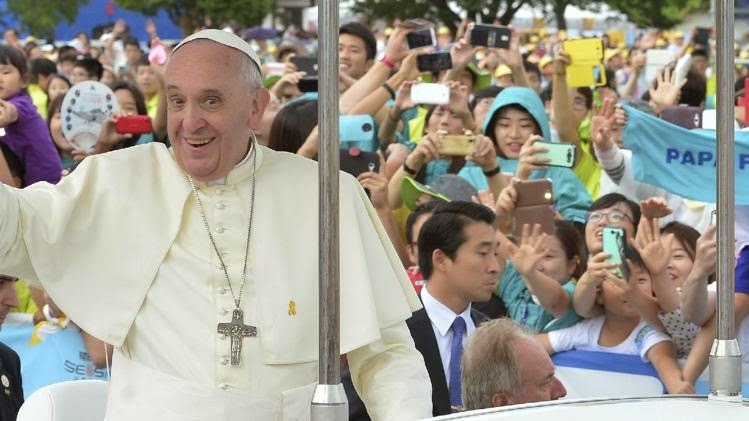 Even with a day to go, the stories coming out of the Pope's weekend in South Korea have been flooding the space: from estimates of a crowd as big as a million for yesterday's beatification of 124 local martyrs to Francis' earthy, unarmored Kia Popemobile, shirking a helicopter to ride a public bullet-train, taking enough selfies to make a Kardashian blush and – in an unscheduled stop at Seoul's Jesuit base – decrying how "much damage" has been done to the church by "our clerical attitudes." Of course, all these share the common thread of a focus far less drawn from the "script" of talks and events than the spontaneous moments that've come up. Along those lines, then, the shot above might just take the cake: in a private moment this morning at the Nunciature in Seoul, Papa Bergoglio baptized and confirmed Lee Ho Jin – the father of a Sewol ferry victim who asked Francis to confer the sacrament during a Friday meeting with relatives of those lost in the April sinking that killed 300 on-board. After the ceremony, it emerged that Lee took Francis as his baptismal name. The catechumen had reportedly been preparing to become a Christian for some time prior to meeting the Pope. Amplified by wall-to-wall coverage on the state broadcaster KBS, the rapturous scenes of the days have served yet again to bolster Francis' status as a mega-draw on the road, and the freewheeling energy he's brought to the intense schedule should (but, for some, likely won't) suffice to rebut another round of speculation on the state of the 77 year-old's health. 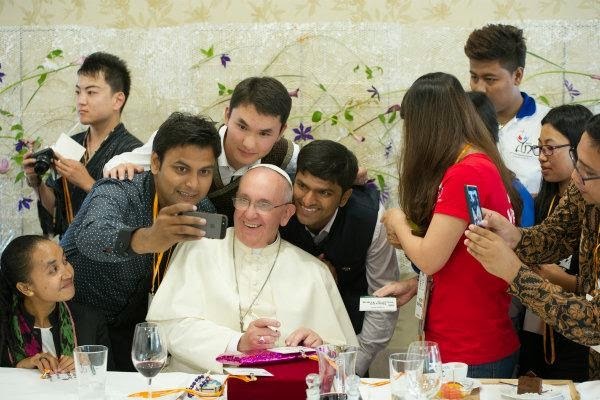 It should be noted here that, aside from the three-yearly global observance of World Youth Day, overseas papal travel in August has traditionally been avoided until this visit. If anything, Assumption Day – the Ferragosto holiday which marks Italians' exodus to the beach and hillsides – invariably saw the Popes offer their one public Mass of the summer residency at Castel Gandolfo's parish church. While Francis made his lone trip to the Alban town to follow suit last year, this vacation season has seen Castel completely shut out. Tomorrow's closing day of the Korea trek brings a poignant coda as the Pope celebrates a morning Mass in Seoul's cathedral for peace and reconciliation between North and South Korea, both of which marked the 69th anniversary of the peninsula's independence from Japan on Friday. While the Communist North refused the invite to send a delegation to the liturgy, the democratic South's President Park Geun-hye – a daughter of the country's military dictator of the 1960s and '70s – is expected to attend. Speaking of this trip's geopolitical angle, meanwhile, after reports that Beijing had demanded the return of Chinese priests from Korea and blocked young people from traveling for the visit, AsiaNews reported earlier today that some 300 Chinese youth were in attendance at today's closing Mass for the continent's Youth Day, the next of which will be held in Indonesia (the world's largest Muslim country) in 2017. Having accomplished a well-known item on his "bucket list" with his first-ever visit to Asia, Francis already has plans to double down: in mid-January, the Pope will open his 2015 calendar with a weeklong swing through Sri Lanka and the Philippines. As that'll be just his fourth overseas trip following next month's one-day jaunt to Albania, at least temporarily, Asia will have the unprecedented boast of the lion's share of a pontiff's time on the road. For now, once this visit enters the books, a key gauge of its success won't take long to be found: whether a Korean church which has posted phenomenal numbers of adult converts over the last several decades sees even more of an uptick next Easter.